In early March, we worked with the company S&P Global to shoot a short documentary piece about an art installation they had commissioned for the Oculus World Trade Center. The art installation was a forced perspective collage made of hundreds of dollars hanging in the air that spelled out “change” from one side, and “pays” from the other. Each bill had a female face printed on it. The campaign was made to inspire conversation about gender equality in the workplace and to stimulate positive change. This short documentary piece was a 6 day shoot in total. We filmed for 1 day in Lititz, Pennsylvania at the fabricator’s workshop; another day at the artist’s design studio in Brooklyn, New York; and then 4 consecutive days at the Oculus World Trade Center filming the installation and the reveal itself. We were fortunate enough to be able to use a tool we don’t often get to work with, the DJI Ronin 2 motorized gimbal system. This allowed us to get long, smooth tracking shots. Normally we use a Glidecam to get similar shots, but the Ronin, in combination with an Easyrig, allowed us to get these types of shots all day, every day without fatiguing at all. On the final day of filming, we brought out both RED cinema cameras that we own for the big reveal. We wanted to make sure we got as much coverage as possible of different people’s reactions to the art piece. This also allowed us to get a larger variety of footage. One camera covered all the moving shots and the other camera did the handheld or locked off shots, generally with a more telephoto lens. Lifestyle Branding Commercial for The Chaddsford Winery! We were recently tasked with making a 30 second lifestyle commercial for the Chaddsford Winery, featuring many of their services and amenities. They wanted a fun, lively video that would make their winery feel like a craft brewery. The brand is all about having a diverse portfolio of approachable, food-friendly wines, which needed to be reflected clearly in the video as well. This is a lot to squeeze into just 30 seconds, but we were up for the task! A lifestyle video is all about using beautiful imagery to show people enjoying life with a specific brand. The key is to hone in on what makes a brand unique and to figure out the best, most creative way to show it off. We started by listing all the amenities at the Chaddsford Winery, including their show floor, wine tastings and bottling in their cellar, private parties, picnics, an on-site gelato truck, social events, and live music. From there, we could create a master shot-list (with a total of 27 shots) and schedule for the entire day. We then put together a cast of actors, models, and some members of the wine club for on-camera talent. We kept the crew small. Brendan acted as director and cinematographer, with Chris as the assistant camera operator, and Aidan as production assistant. 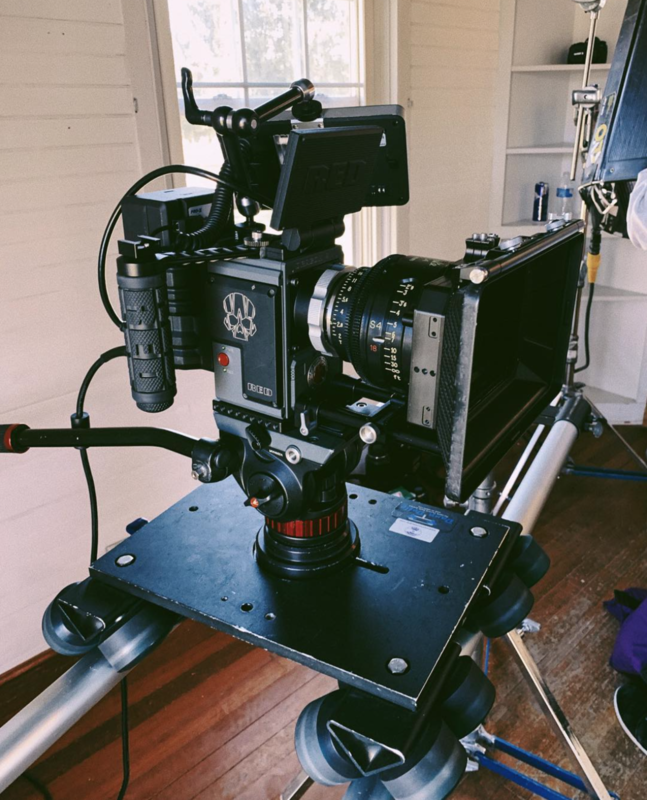 The camera package was our RED Scarlet-W 5k cinema camera with Cooke S4i lenses (the same lenses used to shoot Game of Thrones) and a 4 foot long camera dolly to create some dynamic movement. The lighting package we used was 2 Neweer LED panels, 2 Quasar Science LED tubes, and a Kino Flo 4 foot 4 bank fluorescent light. We also used a portable golden reflector for some of the outdoor scenes to enhance the “magic hour” look. We didn’t have to worry about recording sound for this production because it was decided early on that the video would be silent, with just a music track in the background to set the tone. The shoot day lasted from 9am to 6pm. We filmed a total of 27 shots, with multiple takes of each shot, averaging out to a rate of 3 shots per hour or one new shot every 20 minutes. The final 30 second video includes 19 of the 27 shots we filmed, meaning we had plenty of options in post to pick the absolute best material, with enough extra content to make multiple variations of the video so that Chaddsford Winery can have as much value and as much content as possible! We couldn’t be more happy with how the video turned out! It’s an extremely cinematic, fun, and lively rendition of the Chaddsford Winery. The look of the video is very unique, which comes from a lot of tiny creative choices. The choice to shoot on a very high end camera with a lot of resolution and dynamic range makes a lot of difference. We also chose to rent very nice cinema lenses which are tack-sharp and have a warmness and dimensionality to their look that is really beautiful. We also used a special filter in front of the lenses called a 1/4 Black Pro Mist filter which creates a subtle glowing effect, blooming the highlights and making the image feel very organic and almost dreamlike. The footage was color graded using one of our favorite orange and teal LUT packs from Tropic Color, which makes a huge difference for the final image. These are just a few examples of the extra value that we brought to the commercial. The attention to detail and artistry on this production truly brought it to another level, and we know it will be an extremely useful marketing tool for Chaddsford Winery moving forward! Back in August 2018, we shot a series of videos for Healthination.com for mastectomy patients, focusing on fashion and clothing options for women post-mastectomy surgery. These videos featured Dana Donofree of AnaOno Intimates, a breast cancer survivor and fashion guru. For two of these videos, we had setups of Dana standing in front of various clothing arrangements while talking about them. A two camera setup for this type of shoot worked perfectly because it allowed us to get a full wide shot as well as a closeup of the clothing simultaneously. This allowed us to cut back and forth between the shots seamlessly so Dana could talk freely without having to worry about making mistakes or having to repeat anything. This type of shoot is not normally possible with a crew of only two people, but we’ve spent years finding efficiencies in our workflow to allow us to do just that. 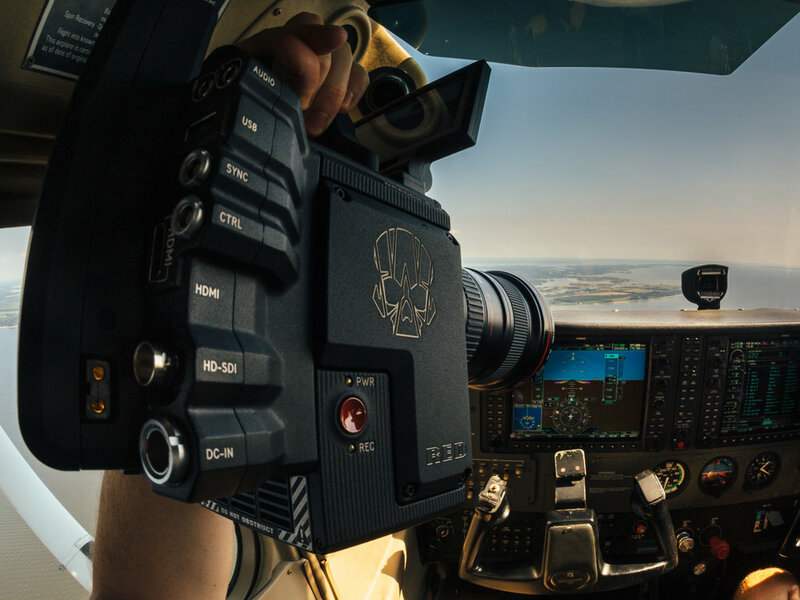 We shoot on RED cinema cameras that are traditionally not meant to be used by single operators; however, the latest RED cameras have been redesigned in such a way that they are smaller, lighter weight, and more modular to allow a single person to shoot on it with ease. We also utilized 2 LED panels with soft boxes to light the scenes because they have very high output without drawing a lot of power. They can also be battery powered, which is quite convenient when we don’t have time to waste plugging them in and running cables across the floor. This also saves time when repositioning the lights for different shots. You can see in the image below I’ve also rigged a Zoom H4n Pro recorder to my camera so I can record and monitor an external audio source while simultaneously operating my camera— just another way I’ve found efficiencies on set! You can watch all the videos we worked on at www.Healthination.com. THIS REVIEW IS A WORK IN PROGRESS, DONE WITH FIRMWARE DSMC RELEASE BUILD V6.3.27. THERE IS NEWER FIRMWARE (DSMC RELEASE BUILD V6.3.78 AS OF 02/03/17) OUT THAT I WILL BE TESTING AND UPDATING IN THE FUTURE. The first time taking my Raven out of the box! This is my first review for a camera but certainly not my first camera that I’ve owned. I came a long way to finally be a RED owner/operator. I began with RCA VHS camcorders back in the early 90s, moved forward with HI-8, Mini-DV (shout out to the Sony VX2100), and then entered the HD realm with Sony Handycam HD camcorders, eventually DSLR’s (I still have my Canon 5D Mark iii at the time of me writing this) and now a RED Raven Dragon 4.5K camera. Now, with this being my first review, don’t expect the polish and in-depth information you’d receive from other professionals in the field who are experts in the craft of reviews and are also paid for their time to accomplish said reviews. I will give what information I can, with what time I have to give, and update as I go while I continue to use the camera. I’ve owned my Raven since August 2016 but refrained from posting much until now because I wanted to get some hours on the camera and not just a weekend. My experience with RED prior to me owning the Raven has always been fairly positive. I first worked with RED as a 2nd A/C on a feature film that was using a RED Epic MX back in 2013 (which isn’t very hands on if you’ve ever 2nd A/C’d). Previously having worked with Super 16mm film had already given me the experience with a more professional workflow of filmmaking, so the process of working around the RED system wasn’t anything foreign to me, but instead, quite familiar. It sure was a slower work-pace than commonly experienced with DSLR type camera environments, but it felt more professional and it felt like you were a part of something bigger. I later was able to 1st A/C and Camera Operate a project in 2014 on the RED Epic MX, which is where I really got to know the camera and its quirks (such as black shading between temperature changes, compression ratios, working with the REDcode, the joy of False Color, etc.) This camera really was similar to working with the film process, just a lot more technical with immediate control of your image. I then shot a short film on the RED Scarlet MX, which I still think is a fine camera, however, my biggest gripe with REDcode back then was the struggle in low-light. I found the shadows to be quite muddy and noisy and compression rates tended to really effect the image in low-light environments. The lack of ProRes always was a downer, eliminating some alternative options of use with the camera. Overall though, the image was spectacular with proper lighting and the ability to get that cinematic look with the resolution it could produce was indeed ahead of its time. Being able to achieve quality that was commonplace in the movie theaters was just an incredible feeling. Not to mention the complete control and amazing experience working with RAW files. I had experience working with RAW still images and once I finally had the first hand experience to get just that with video, thanks to RED, I immediately fell in love. I eventually was able to work the RED Epic Dragon sensor and that’s when I saw this camera really show its true potential. But, this is a review of the RED Raven so I’ll cut to the chase. I used to always say the day RED makes a camera under $7,000, I would buy one and nearly weeks after I began making that statement, the RED Raven was announced. I dropped the deposit in September days after the announcement and began my anxious wait for the March 2016 release date. And I waited . . . and I waited . . . and waited . . . and this is where it became a bit of a problem. March 16th rolled around and RED had little information on my allocation for the September pre-order. Then April rolled around, then May, and at this point my faith with RED began to be shaken. I pre-ordered within days of the announcement, we were past the announced release time-frame and there was still no camera words in sight (or is it in ear? in hear? regardless! ), let alone when I would receive it. I eventually didn’t end up receiving my RED Raven until August 2016, nearly 1 year after my pre-order. In this time-frame, people gave up waiting, moved over to other camera platforms, and RED even increased the price of the camera by $1,000. I was lucky enough to be a part of the early adopter pricing of just under $6,000 for the brain. Of course it costs a lot more to get the camera all up and running. In the end, I feel RED underestimated the demand of the camera, undercut itself in pricing, and backed itself in a corner by offering such a great camera at such a low price point. Now, there are comparable cameras at price point offered by other brands such as Blackmagic Design, but there is something magical about RED’s sensors and the name RED does hold weight and for good reason. My first time filming with the Raven, I only thought it was right to let it spread its wings! Now that I gave you a backstory and enough talk about everything BUT the review, I can say it was well worth the wait. I am absolutely satisfied (somewhat) in this camera with no gripes or complaints (sort of)! I’ll “begin” by explaining how this is RED’s new DSMC2 generation of cameras. DSMC stands for Digital Stills Motion Camera and 2 for it being the second generation of body style. The DSMC2 is more modular, smaller and a lighter solution for RED that allows more ease at user customization, drone and gimbal rigging, as well as overall mobility of the camera. I am a fan of the body style and for those wishing to achieve that “big-budget camera look,” trust me, this thing can be built up as large and heavy as the rest of the bunch if need be! The camera uses the Dragon sensor, which is significantly improved upon its predecessor, the MX sensor. This sensor allows for higher dynamic range, better abilities in low-light, as well as better managing compression rate ratios in camera, which basically allows you to shoot at higher compression rates without negatively effecting the quality of your image. RED can be confusing with its name, labels, camera body, sensors, etc. You often find clients asking for a RED Epic, which could mean Epic as in the style and build of the camera, which there is a DSMC and a DSMC2 version, as well as there is an Epic with a MX sensor, and a Epic with a Dragon sensor, as well as an Epic with a 8K Helium sensor known as the Epic-W. You can ask for a RED Dragon, and technically, you may think you mean Epic Dragon, but you end up with a RED Scarlet Dragon or even a RED Raven which is indeed a Dragon sensor! Or you can ask for a RED Scarlet, which could be a RED Scarlet MX sensor DSMC body, or a RED Scarlet Dragon, or a RED Scarlet W, Dragon sensor, DSMC2 body. And now we have the new Helium sensors and can shoot anywhere between 4K and 8K and a RED Scarlet MX can shoot 4K while a RED Scarlet Dragon and Scarlet-W can shoot 5K while a RED Raven Dragon can shoot 4.5K. Are you still following? Good! -It records ProRes in 2K either stand-alone or simultaneously with RAW recording. -It has lower compression ratios and handles higher compression ratios better than previous sensor. -It is lighter! It is smaller! It is modular! -16.5+ stops of dynamic range! -You know what? You can get all this stuff on RED.com! Go there and read up on the tech specs! Let’s keep moving! My current studio build for the RED Raven equipped with gear from Redrock Micro, Wooden Camera, Tilta, Switronix, Tiffen, Canon, Zacuto and SmallHD. Above is a recent image of my RED Raven. It is displayed equipped with a Redrock Micro studio matte box with Tiffin 4 x 5.6 ND filters, Wooden Camera Easy Riser w/ 15mm bracket, Zacuto 6.5″ aluminum rods, Tilta follow-focus, Core SWX HyperCore Slim RED V-mount batteries, SmallHD 701 (on opposite side) and a Canon 24-105L. I’ll say this now, the Canon 16-35L ii is a much better all around lens for the camera, as it is f/2.8 and better serves the crop-factor the camera dishes out. I own the Canon 16-35L ii as seen in the above picture of the Raven flying high in the sky but was doing 24-105L tests when this picture was taken. I bet you just want to see some footage by now. Okay, okay. Below you’ll find some footage shot with the RED that I’ll follow up with some closing thoughts! There you have it! I know there is definitely more I could say but I feel this post is running its course in length. Some final thoughts are that I love the size. It really makes it more feasible to be more mobile with this camera, however, you have to pay to achieve mobility. If you get just a top handle, it will be weird and uncomfortable to go handheld that way and I often find that the placement of the handle (height) with the monitor makes the handle slightly in the way of the LCD but not really. Wooden Camera makes a cable that allows you to get the live-mounted LCD monitor off of the brain for use but that is a couple hundred dollars, plus the cine-arm you’ll need. A DSMC2 side handle is around $900 and the cheaper option for a side handle is around $500 so you do have to spend a little to make the camera comfortable to use off of a tripod. So, I guess you can say, the awesome ability for this camera to be fully modular also can be a bit of a hinderance if you want a camera to be ready to up-and-go out of the box. I would plan to spend anywhere between $10,000-$15,000 to get this camera to be what you truly want from studio setting, to handheld, to shoulder rig. But that still is not bad pricing to shoot 4.5K RAW with a RED Dragon sensor. I will continue to post things, both video and thoughts, as I progress through my journey with this camera but I will end this post on that note and open up a discussion in the comments for me to better address your questions and comments without dragging this on for eternity! If requested, I can consider doing a review video for this or others in the future if that would be more effective than a full on blogpost. Things to think about moving forward!